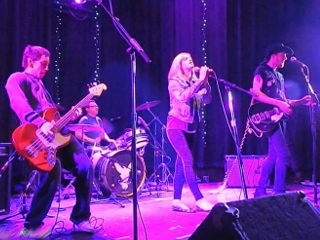 Werewolf With A Shotgun is a dark mix of surf, punk, and americana lead by MelissaD on vocals. All other band members are family, Randy "Bam Bam" Ochsenrider of The Slammies and Dandelion Abortion on drums, and his sons Brandon Ochsenrider and Chris Thunderkiss. We've been called "a hillbilly X on an acid trip on the beach" by some guy at a bar. Our debut EP, Werewolf With A Shotgun, is now available via bandcamp or physically during a live event or through email order.